When my children were at school I used to bake a batch of biscuits at least once a week and these were a great favourite. I must have written this recipe out for Mum grabbing the first bit of paper I could find and used a texta to write with, not a great piece of penmanship. It comes out of one of my biscuit cookbooks that was published in the 60s, but I made them a lot later than that. You’ll need 125g of butter. 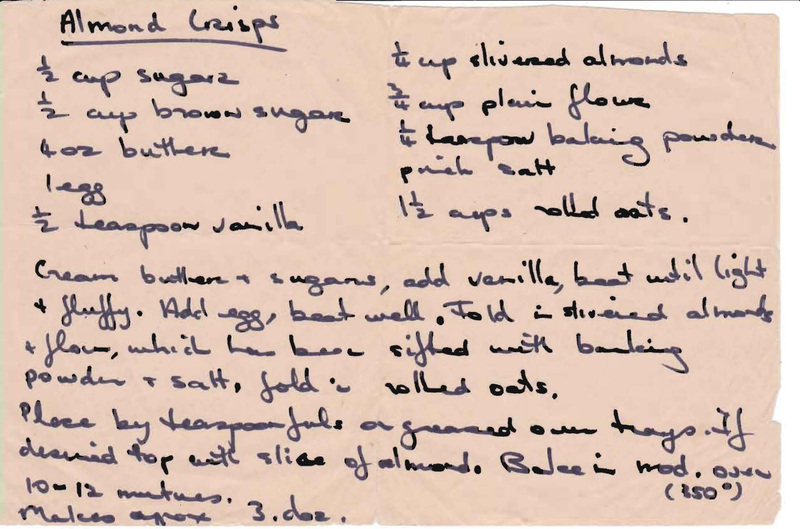 This entry was posted in All Recipes, Biscuits & Slices and tagged 1980s, almond crisps, almonds, brown sugar, butter, rolled oats by bebsrecipes. Bookmark the permalink.